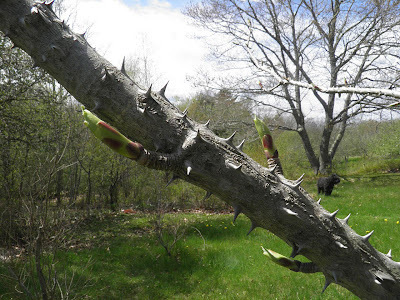 Devoid Of Culture And Indifferent To The Arts: Gardening: Kalopanax Tree – for those with prickly personalities! Gardening: Kalopanax Tree – for those with prickly personalities! Yeah, like Napoleon ever really listened to that bit of his own advice… And before any of you that actually know me think it, I admit I’ve been known for a prickly personality too. Maybe that’s why I’m so fond of this particular tree. If you follow my blog you’ll already know that I tend toward the exotic and somewhat unusual in my choice of plants for my garden. This tree is no exception. I’ve had this plant for close to 20 years now, purchasing it when it was probably about 2 feet high. It’s grown considerably since then. Kalopanax is a difficult tree to find here in Nova Scotia. I don’t think I can remember ever seeing it for sale after I bought it. That’s a shame, because it’s beautiful. 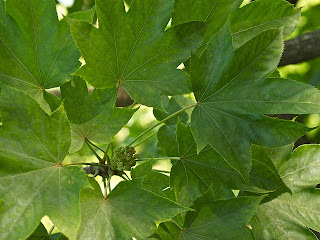 Kalopanax septemlobus (prickly castor tree), is a deciduous tree in the family Araliaceae, the only species in the genus Kalopanax. Deciduous means that it loses its leaves in the fall. It is native to Asia. The family Araliaceae is a large grouping of plants otherwise known as the Ivy Family (of all things…). 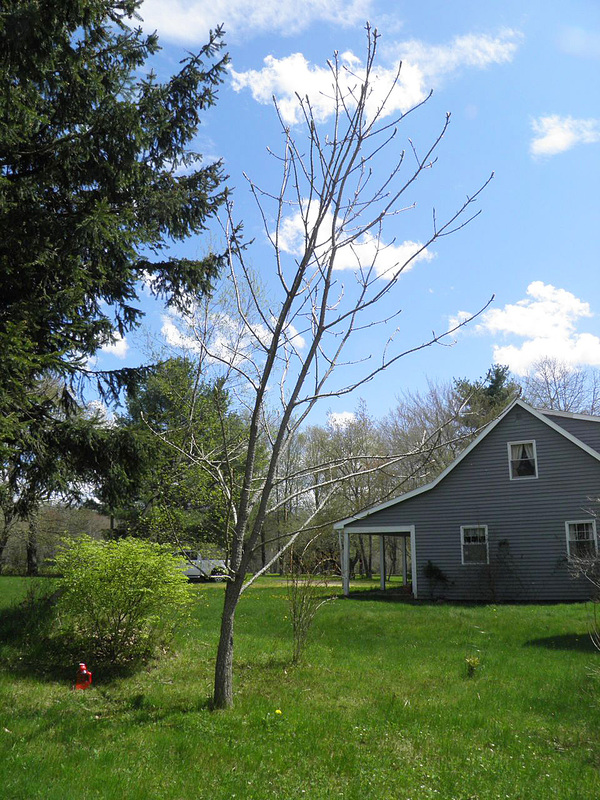 It includes 254 different species of trees, shrubs and herbaceous perennials. Most in the species have flowers that are born in large “panicles” or dense clusters of flowers, like the kalopanax. This is not a small tree when fully grown. It can reach heights nearing 100 feet. 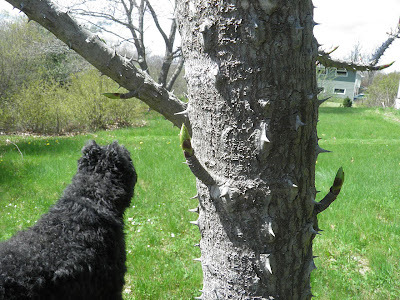 Its most distinguishing characteristic is the spines that cover the trunk and branches. They are hard, woody and sharp and can be about 1/2 inch long. There are only two other spiny trees I can think of in Nova Scotia to compare: locusts and hawthorne. The leaves are palmate, which means they are divided into cut lobes. To me they look much like maple leaves on steroids with serrated edges. They are attached by a stem that is about 12” long, and the leaf itself can reach that width. As you can imagine that makes the tree quite dramatic in a breeze. The leaves are green through the growing season and then turn yellow in autumn before switching to dark brown and dropping off. Every year we get quite a pile of them. I’ve actually framed a few and have them hanging inside. They’re very interesting. As I said, this tree must be 20 years old, but I’m still waiting for the panicles of flowers. They are (supposedly) produced in late summer in 10”-20” wide sprays. The flowers themselves are white and quite small in scale to the tree. Maybe this year… But I’ve been saying that every year for about a decade. Kalopanax is an excellent shade tree to grow if you’re looking for something a bit tropical and exotic in appearance. It is extremely cold hardy and can withstand temperatures down to -40°F. That’s cold, when you think that in Nova Scotia we usually don’t exceed -25°F. 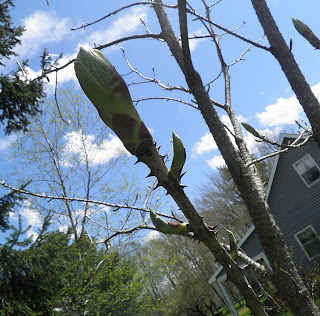 The plant is supposed to grown very quickly at first, but I found that mine took its own sweet time to begin to branch out and become what one would call a “tree.” In some areas of the USA it is classified as invasive. No sign of that with mine. But this particular kalopanax is well on its way now, and those flowers certainly can’t be too far off. Can they? Henry, oblivious to the menace behind him. But is that menace the tree, or his dad? Massive leaves require massive leaf buds. This tree is spectacular in leaf.